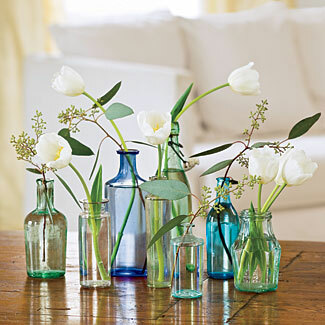 It is officially Spring and even if it may not feel like it from the outside, depending on where you live, you can still give your home interior an uplifting burst of color and florals with some fresh Spring decor. I especially love this time of year and don’t mind putting away my cute snowmen and winter birds to replace with flowers and more colorful decor. 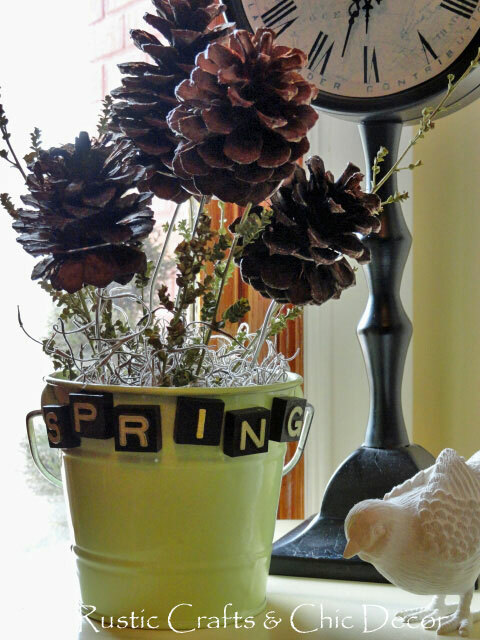 I just pulled out my potted pinecones, in a colorful pail, which is an easy rustic Spring Craft. A collection of vintage bottles filled with single floral stems is a great way to add some Spring freshness and aroma into your decor. The variety of shapes, sizes and colors provide and interesting display. 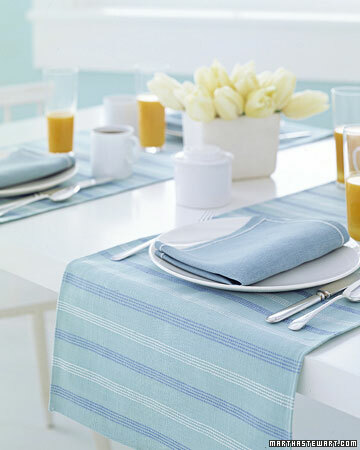 I love this simple idea by Martha Stewart for making a festive and practical Spring table. Instead of using a table running in the usual way, she shows using two at this table, running across the ends, acting as placemats for two people. Here is a fantastic look for Spring that blends perfectly with rustic decor. 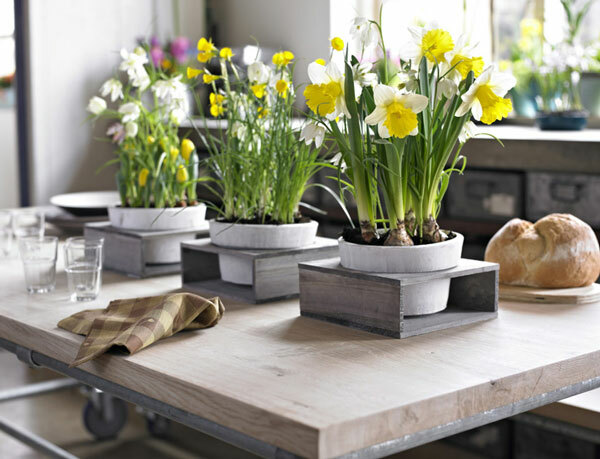 These potted flowers look perfectly at home in the rustic box bases. Here is a fun and colorful way to display your favorite floral stems. 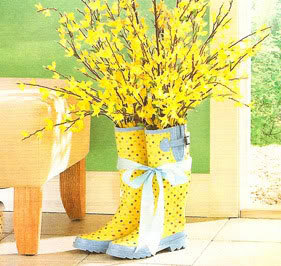 I love shoes and boots anyway so, for me, it would be a natural fit to shop for rain boots to use in my decorating! 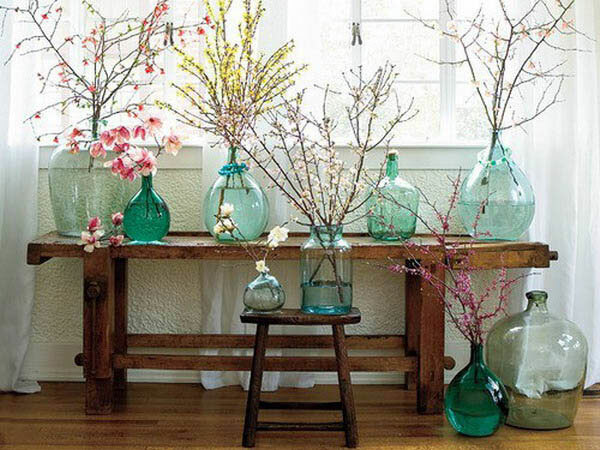 I also really love the idea of using flowering branches over floral stems in large glass vases. 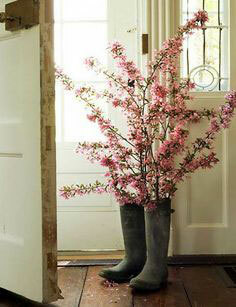 For more Spring decorating ideas, check out my post on Shabby Chic Spring Decorating Ideas. I hope you have been inspired!